Sandium Heating and Air Blog: How Important is it to Have a Well Ventilated House? How Important is it to Have a Well Ventilated House? If we sealed our home entirely, we would only get fresh air inside when we opened a door or window. We require ventilation to exhaust bad odours, water vapour as well as air pollution, and replenish them with fresh air, but we also need to manage ventilation to ensure that we are able to turn it on and off as we require it, and direct it exactly where it is essential. In this way we can stop the waste of heat in the way that water is wasted through dripping taps. We then only lose the heat in air permitted to escape for ventilation purposes. Conventional wisdom has established that an average-sized space demands a minimum of 1air change per hour when occupied. Howeverthis varies and is dependent on such elementsbecause the number of occupants and the number and nature of the sources of pollution. Traditionally, ventilation was achieved using the use of air bricks and infiltration; nevertheless, as our energy conserving becomes much more sophisticated, we have to develop a correspondingly much more sophisticated ventilation strategy. Prior to listing the possiblemeasures inside a strategy, we shall take a look at ventilation for combustion and heat exchangers. It is a statutory situation that heating appliances which need air from inside a room for secureoperation should possess a permanent ventilator. The danger is that the fuel does not burn effectively without sufficient oxygen; if toxic products of combustion aren't exhausted, they are able to build up in a room and possibly prove fatal. In old houses the original ventilators are often papered over and it's obviously essential that either they are unblocked or an alternative route is found for the incoming combustion air. One way of providing this alternative route is via a purpose-built duct delivering air straight towards the appliance. Many modern appliances overcome this problem by having a balanced flue which draws air from the outdoors and expels it through exactly the same fitting. Is there any way we can conserve the heat lost via controlled ventilation? Heat exchangers are designed to do just this. They're a relatively new method of recovering the heat from warm air prior to it is exhausted to the outdoors, and are being utilized increasingly as part of an overall strategy for ventilation and energy conservation. The principle is easy: the outgoing air is extracted through a matrix of hollow tubes and fins which warm the incoming air contained within them. In biggersystems, warm air is collected via ducts from numerous locations around the house, like bathrooms and kitchens, and the warmed fresh air is delivered to the residing rooms. 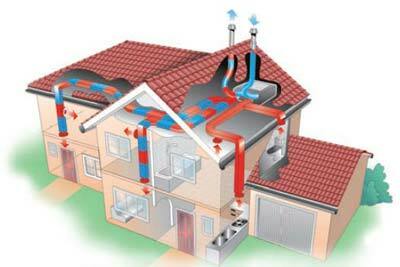 The heat exchanger may be placed any place in the home but the roof space will be the usual location. Expert guidance is essential if you're considering of putting in a heat exchanger. Determine whether to install a heat exchange method. Fit controllable trickle ventilators in each space to obtain cross ventilation (the ease with which these can be fitted to current windows varies using the kind of window). Set up mechanical extractor fans in kitchen and bathroom, controlled by a timer or humidistat (moisture manage switch). Setup permanent ventilation needed for combustion appliances that rely upon a source of air from inside. Use defunct chimneys as channels for ventilation or ducting. This may be particularly helpful if it's difficult to fit ventilators to the windows. Consider also utilizing your chimneys to recirculate warm air to upper storys or vice versa. Install air-cleaning measures: either mechanical or biological, ionisers or filters. When the primary problem is humidity then think about using a dehumidifier and if lack of humidity then consider a misting humidifier or again the usage of plants. Open and close windows as necessary: if external doors are constantly being utilized, this might provide sufficient ventilation for much of the day. After reading this post,I've imagine the need that how important is Well Ventilated House.It's so convenient in the hour of need of in the time of emergency.thank you very much for sharing.keep posting.